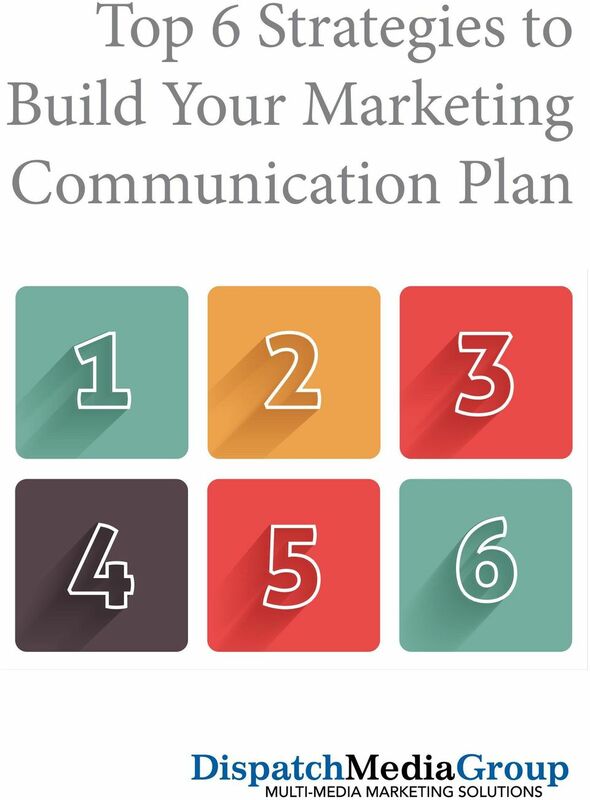 Download "Top 6 Strategies to Build Your Marketing Communication Plan"
2 Introduction With the plethora of new marketing tools available it can be difficult to know whereto begin. Do you start with a company Facebook page, a website, or by running ads in your local newspaper? This ebook will discuss 6 strategies for how to effectively build your marketing communication plan. 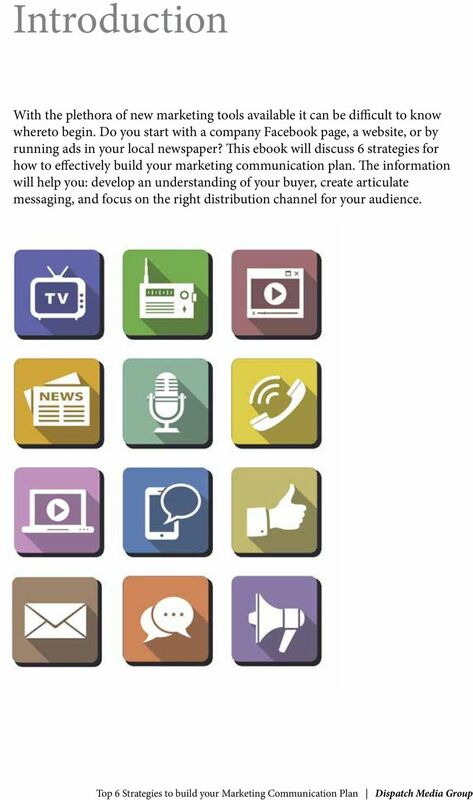 The information will help you: develop an understanding of your buyer, create articulate messaging, and focus on the right distribution channel for your audience. 3 Understand Your Target buyer Foundational to effective marketing is developing a deep knowledge base about your target buyer. The more information that you can amass about your typical consumer, the more effective marketing content you can produce. 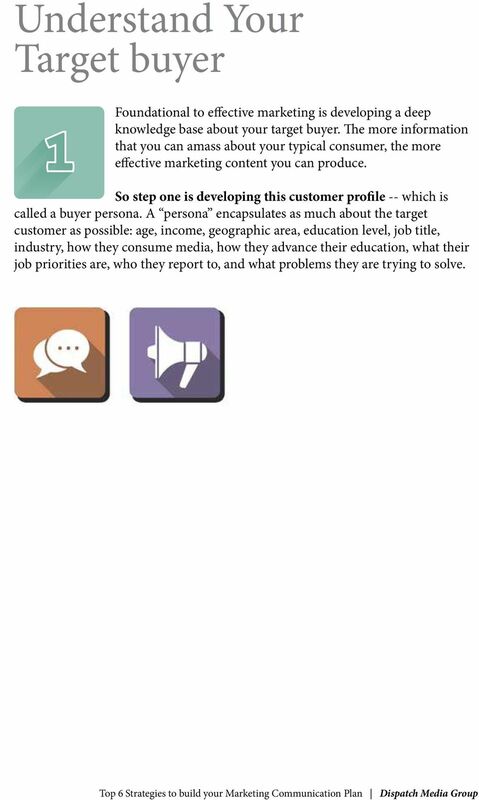 So step one is developing this customer profile -- which is called a buyer persona. A persona encapsulates as much about the target customer as possible: age, income, geographic area, education level, job title, industry, how they consume media, how they advance their education, what their job priorities are, who they report to, and what problems they are trying to solve. 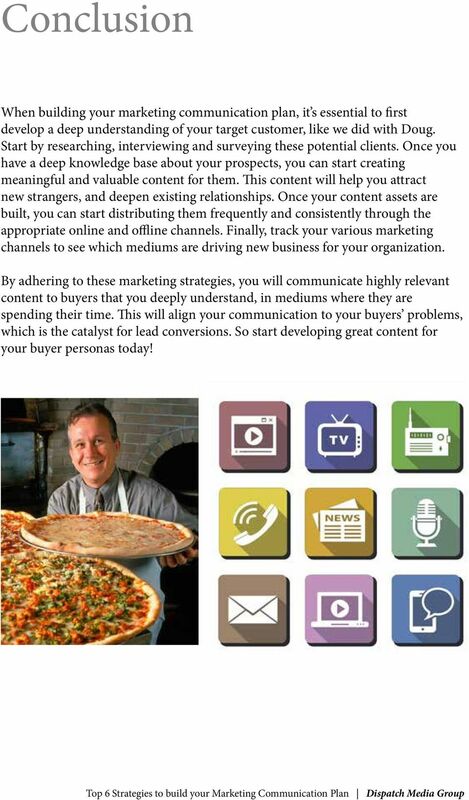 4 Buyer Persona Example Doug is a 47 year old entrepreneur who owns a string of local pizza restaurants in the Columbus area. Doug has his Bachelors in marketing from the University of Delaware and has recently taken some classes in accounting to help him manage his growing business. 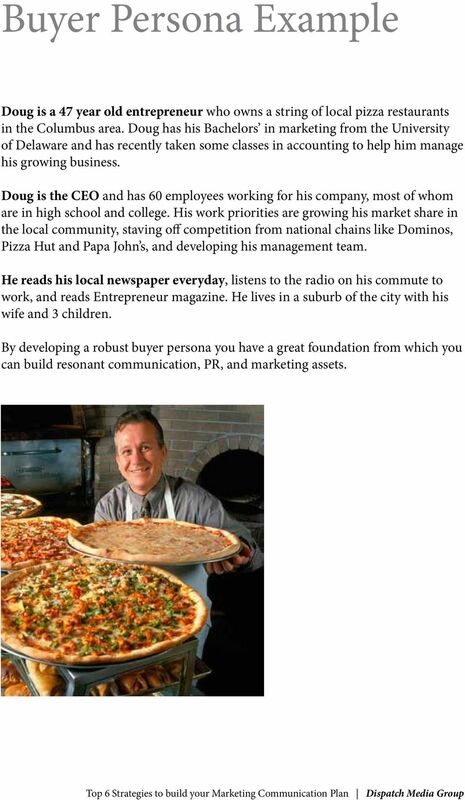 Doug is the CEO and has 60 employees working for his company, most of whom are in high school and college. His work priorities are growing his market share in the local community, staving off competition from national chains like Dominos, Pizza Hut and Papa John s, and developing his management team. He reads his local newspaper everyday, listens to the radio on his commute to work, and reads Entrepreneur magazine. He lives in a suburb of the city with his wife and 3 children. By developing a robust buyer persona you have a great foundation from which you can build resonant communication, PR, and marketing assets. 5 Develop Content Assets Once the buyer persona is developed, you have a much deeper understanding of how to reach people like Doug, what priorities Doug is trying to achieve, and how Doug consumes information. This is the baseline from which you can start creating marketing communication assets. These marketing assets are the fuel that drives new visitors to your business, and strengthen existing prospect relationships. The content that you develop can and should be varied, ranging from press releases, customer success stories, sell sheets, product and service guides, presentations, infographics and videos. These marketing assets will help you move people from the search engines, blogs and social media platforms to your website and landing pages. Use the information that you have gathered from your buyer persona research to craft these marketing assets. Weave into your content information what is unique and valuable to your buyers. Answer common questions that they have, and address problems that they are facing. 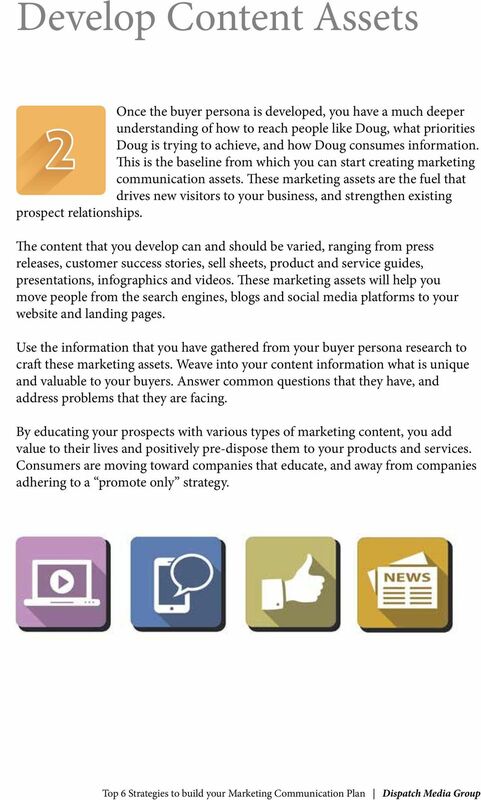 By educating your prospects with various types of marketing content, you add value to their lives and positively pre-dispose them to your products and services. Consumers are moving toward companies that educate, and away from companies adhering to a promote only strategy. 6 Distribute Your Content Once you have developed your content assets it s important to then place them in the appropriate medium so that they can be consumed by your buyer persona. Essential to making sure you re using the right marketing medium is buyer persona research. Are your buyers using online channels like blogs, forums and websites? Are they using social media platforms like Facebook, Google Plus or Linkedin? What newspapers and magazine are they reading? What radio stations do they listen to and what TV channels do they watch? What search engines to they utilize to gather information? 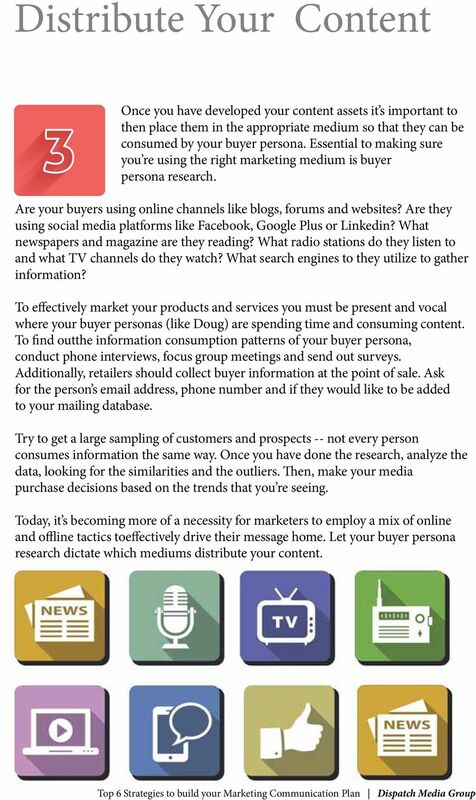 To effectively market your products and services you must be present and vocal where your buyer personas (like Doug) are spending time and consuming content. To find outthe information consumption patterns of your buyer persona, conduct phone interviews, focus group meetings and send out surveys. Additionally, retailers should collect buyer information at the point of sale. Ask for the person s address, phone number and if they would like to be added to your mailing database. Try to get a large sampling of customers and prospects -- not every person consumes information the same way. Once you have done the research, analyze the data, looking for the similarities and the outliers. Then, make your media purchase decisions based on the trends that you re seeing. Today, it s becoming more of a necessity for marketers to employ a mix of online and offline tactics toeffectively drive their message home. Let your buyer persona research dictate which mediums distribute your content. 7 Build Frequency Once you have settled on the channels to use to market your products and services, you need to develop a communication calendar to control the frequency of messaging. By frequency, I mean the number of times that a person needs to be exposed to your marketing and advertising message before a response is made. The communication frequency can take a variety of different forms, depending on the marketing medium you re using. 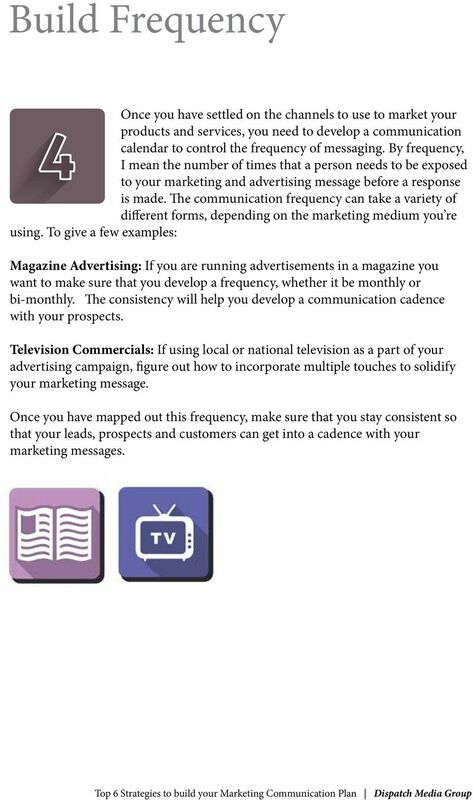 To give a few examples: Magazine Advertising: If you are running advertisements in a magazine you want to make sure that you develop a frequency, whether it be monthly or bi-monthly. The consistency will help you develop a communication cadence with your prospects. Television Commercials: If using local or national television as a part of your advertising campaign, figure out how to incorporate multiple touches to solidify your marketing message. Once you have mapped out this frequency, make sure that you stay consistent so that your leads, prospects and customers can get into a cadence with your marketing messages. 8 Develop Multi-Touch Campaigns In addition to communicating your marketing message frequently and consistently, it s important to build multi-touch marketing campaigns. A multi-touch campaign is marketing communication that encounters your buyer personas through different medium. 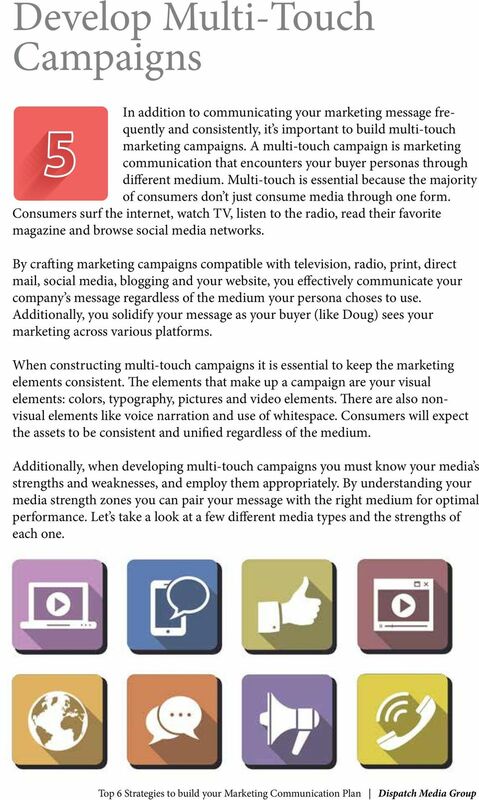 Multi-touch is essential because the majority of consumers don t just consume media through one form. Consumers surf the internet, watch TV, listen to the radio, read their favorite magazine and browse social media networks. By crafting marketing campaigns compatible with television, radio, print, direct mail, social media, blogging and your website, you effectively communicate your company s message regardless of the medium your persona choses to use. Additionally, you solidify your message as your buyer (like Doug) sees your marketing across various platforms. When constructing multi-touch campaigns it is essential to keep the marketing elements consistent. The elements that make up a campaign are your visual elements: colors, typography, pictures and video elements. There are also nonvisual elements like voice narration and use of whitespace. Consumers will expect the assets to be consistent and unified regardless of the medium. Additionally, when developing multi-touch campaigns you must know your media s strengths and weaknesses, and employ them appropriately. By understanding your media strength zones you can pair your message with the right medium for optimal performance. 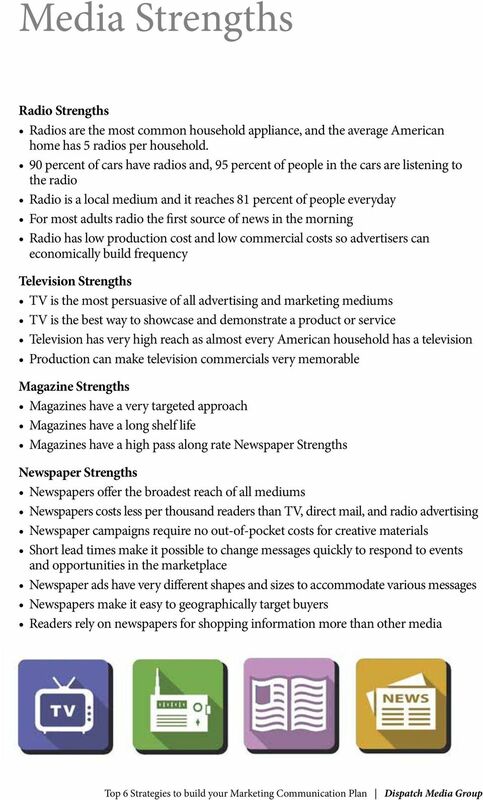 Let s take a look at a few different media types and the strengths of each one. 11 Measure Your ROI As a small business owner, it s imperative that you vigilantly track your marketing and advertising metrics. By diligently tracking these analytics, you can extract meaningful data about what mediums are performing well and which are performing poorly. Let s look at some practical ways to start tracking the effectiveness of your marketing and advertising efforts: Ways to track marketing effectiveness: Some easy ways to implement trackable marketing campaigns are by using the following tactics: unique landing pages, unique phone numbers, promotional codes, and analytics software. Let s dive into each one a little bit more here: Unique Web pages: By creating a unique web site page or landing page, you can track the effectiveness of your campaigns. By directing people from your radio, TV or direct mail campaign to a specific website page, then tracking the number of visits thatyou get to that page, you can very easily see if your advertising has been effective. 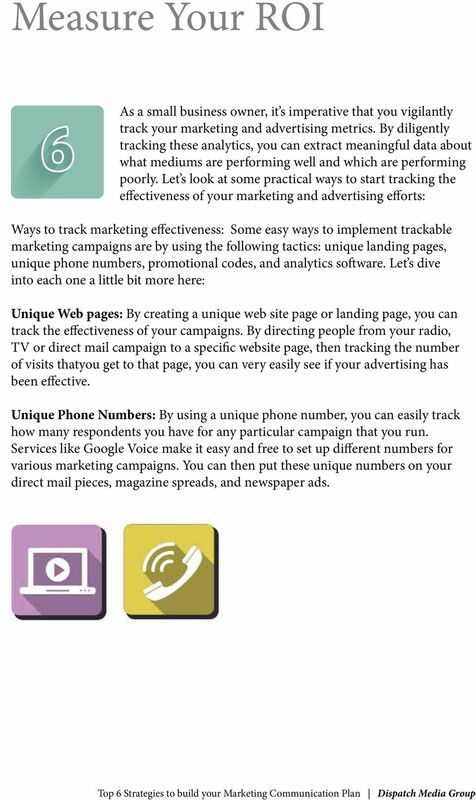 Unique Phone Numbers: By using a unique phone number, you can easily track how many respondents you have for any particular campaign that you run. Services like Google Voice make it easy and free to set up different numbers for various marketing campaigns. You can then put these unique numbers on your direct mail pieces, magazine spreads, and newspaper ads. 12 Measuring ROI Promotional Codes: Promotional codes are another great way to get visibility into who is seeing and responding to your marketing campaigns. By setting up a dedicated promotional code and running it for a unique campaign you can easily run reports to see how many people responded to your marketing message. 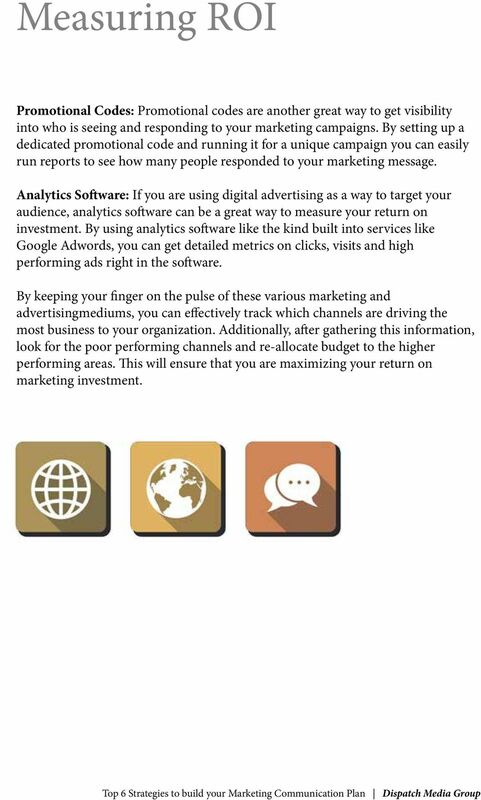 Analytics Software: If you are using digital advertising as a way to target your audience, analytics software can be a great way to measure your return on investment. By using analytics software like the kind built into services like Google Adwords, you can get detailed metrics on clicks, visits and high performing ads right in the software. By keeping your finger on the pulse of these various marketing and advertisingmediums, you can effectively track which channels are driving the most business to your organization. Additionally, after gathering this information, look for the poor performing channels and re-allocate budget to the higher performing areas. This will ensure that you are maximizing your return on marketing investment. 13 Conclusion When building your marketing communication plan, it s essential to first develop a deep understanding of your target customer, like we did with Doug. Start by researching, interviewing and surveying these potential clients. Once you have a deep knowledge base about your prospects, you can start creating meaningful and valuable content for them. This content will help you attract new strangers, and deepen existing relationships. Once your content assets are built, you can start distributing them frequently and consistently through the appropriate online and offline channels. Finally, track your various marketing channels to see which mediums are driving new business for your organization. By adhering to these marketing strategies, you will communicate highly relevant content to buyers that you deeply understand, in mediums where they are spending their time. This will align your communication to your buyers problems, which is the catalyst for lead conversions. So start developing great content for your buyer personas today! 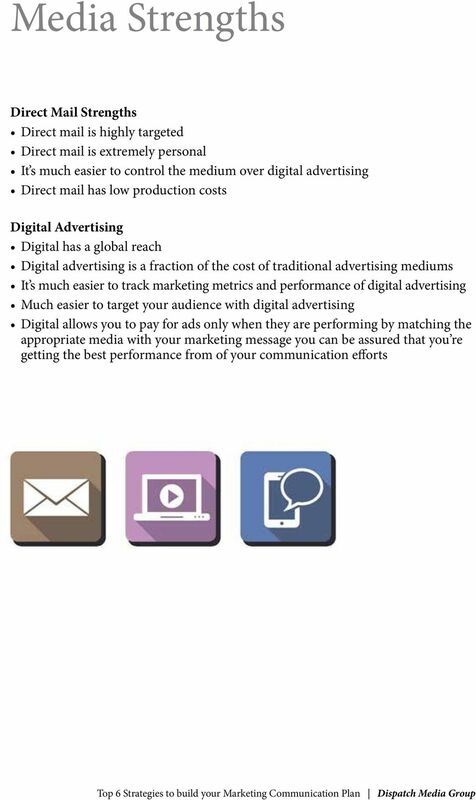 14 For help with your marketing needs contact your Dispatch Media Group account executive or reach us via our website. Product Marketing Manager JOB TITLE: Product Marketing Manager Either Part Time or Full Time COMPANY DESCRIPTION: SmartUQ (SmartUQ.com) provides breakthrough analytics software for engineering applications. Social Media for Automotive Dealers. A Look at How Social Media Empowers Dealers Through Increased Exposure and Interaction With Consumers. Plus, although B2B marketing budgets have increased, the number of channels may far surpass what you can do with your budget. INBOUNDMARKETING. For Beginners. Everything you need to know to get started. HiP COMPANY PRESENTATION Table of Contents About HiP 3 About Bret Smith, CEO & Founder. 4 The HiP Difference 5 Industry/Vertical Expertise 6 Products and Services.. 7 Clients.. 21 Client Testimonials. BEST PRACTICES, Social Media. Project Summary Paragraph Please provide a summary of your project, program or practice in 150 words or less. Content marketing strategy in five simple steps.